Food trucks + two cash bars + more TBA! The Opening Event is free and open to all + admission is always free during regular hours. (Los Angeles, CA) – Thinkspace is pleased to present Nexus II at Glendale’s Brand Library & Arts Center. A group exhibition featuring works by a curated selection of New Contemporary artists, the spe-cial project will include mini solo exhibitions by Drew Merritt, Ermsy, Super A, and Robert Proch, along-side a mural and installation by Bumblebeelovesyou, and sculptural installations in the Library’s outdoor courtyard by Spenser Little. Nexus II will feature a varied cross-section of new work by sixteen international artists belonging to the New Contemporary Art Movement, including Kathy Ager, Liz Brizzi, Stephanie Buer, Adam Caldwell, EINE, Evoca1, Benjamin Garcia, Molly Gruninger, Stella Im Hultberg, Leon Keer, Huntz Liu, Natalia Rak, Joanne Nam, Laurence Vallieres, Cinta Vidal, and The Perez Bros. Known for it’s renewed emphasis on figuration, representational genres, and narrative in the wake of art academe’s conceptual turn of the 90s, the New Contemporary Art Movement is shaped by a foundational countercultural edge, public activations, and its social impetus. Largely self-supported and community-driven, the movement has taken shape beyond gallery walls and outside of traditional institutional vetting. Now, as diverse and heterogeneous aesthetically as it is geographically and culturally expansive, the New Contemporary has come into its own as a globally energized art movement. Known for his dramatically staged and hyper-realistically rendered figurative works, Los Angeles-based painter Drew Merritt is interested in exploring the shifting expressive tensions of the human figure. With the exaggerated impact of stark visual contrasts, Merritt pushes his works into the realm of fantasy with heightened extremes, costuming, and mise-en-scène. Something visceral and uncomfortable prevails in Merritt’s highly stylized works, in their complete reduction of context to uneasily arrant white backgrounds, and in their Baroque preference for the theatricality of effect. At times, Merritt’s imagery borders on the grotesque, but the beauty of the work’s execution delays the immediate recognition of its stylized proposition of human darkness. This balance of contradictory impuls-es sustains the fascination of the artist’s human renderings; psychologically suggestive and open-ended, the works are an invitation to interpret and project. At times vulnerable and others foreboding and contorted, his figures are poignant assertions of human vulnerability in the midst of bleak white noise. English, Paris-based illustrator and artist Ermsy takes the popular cartoons of his childhood and reimagines them as irreverent appropriations. Fascinated by American pop culture as a readily accessible, visual vernacular, Ermsy’s take on its beloved illustrated characters is both satirical and participatory. These adult-themed bastardizations of Garfield, Loony Tunes, The Simpsons, and the like, are simultaneously elated and anarchic in their absurd display of debauchery like tendencies. Using familiar characters provides Ermsy with a set of pre-established imaginative boundaries within which to work. Like a hot-boxed descent into an alternate universe of nostalgic psychotropic Saturday morning cartoons, his world is a playful subversion of familiar, pop cultural fodder. Dutch artist Stefan Thelen, better known by his moniker Super A, creates hyperreal murals and studio paintings that explore the world of human contradiction. Through the combination of realistic and surreal imagery, Super A is often dealing in visual metaphor and social messaging, questioning the ideologies and cultural myths we’ve become too complacent at accepting without critique. Interested in the interroga-tion of objectivity and its ultimate exposure as a construct, Super A combines elements of realism with the free reign of fiction to produce unexpected results. Domestication is Thinkspace’s first solo presentation of Super A’s work. His well-established alias is a creative alter identity created to explore more contentious and difficult subject matter as a muralist in the public sphere. His most recent body of works strips cartoon, fairytale, or pop cultural archetypes of their fantasy and veneer, revealing the realistic or historical counterparts beneath them. An apt commentary on the dissimulation of popular cultural mythology, Super A deconstructs its theater. Polish artist Robert Proch is a muralist, painter, and animator known for dynamic paintings that loosen the representational towards the abstract. His works, nearing an at times cubist or futurist deconstruction of figure and space, remain grounded in a language of relatable, albeit stylized, realism. As emotionally charged as they are formally complex, Proch dissembles and reconstitutes shifting spatial planes through the elemental reduction of form and movement to its most essential geometries and fragments. Interested in this graphic distillation of motion, Proch has studied the technical reduction of form exten-sively and works primarily from imagination rather than photographic resources. This freedom of stylization evolved early on for Proch, when, working as a graffiti artist on lettering, he became increasingly expert at abstract composition. Now the urban landscape and its inhabitants are the artist’s primary source of inspiration, incorporating its architectures and daily activities into arresting scenes of controlled chaos. In Women We Trust, Proch presents a new series of paintings in which women figure exclusively as the kinetic protagonists. Los Angeles-based muralist and artist Bumblebeelovesyou creates whimsical works in which children figure prominently as positive emissaries of truth, innocence, and light. Interested in themes of communi-cation, transition, and change, Bumblebeelovesyou’s simple, graphic works incorporate nostalgic ele-ments like 80s pajamas, paper airplanes, and phone booths, and play with ideas of memory, cultural col-lectivity, and personal recall. Self-taught artist Spenser Little creates elaborate sculptural works and installations using simple, continu-ous lengths of hand-bent wire. His sculptural ‘drawings’ are part problem resolution and strategic negotia-tion; each piece a contained proposition and resolution, a series of moves and choices like a game of chess. Little’s works range in theme and format; some are single bits of text and wordplay, others, de-tailed portraits or elaborate, large-format compositions. Activated by their public placements throughout cities, the wire pieces are poignant physical interventions into the landscape that compel the viewer to reconsider their surroundings. Thinkspace was founded in 2005; now in LA’s Culver City Arts District, the gallery has garnered an international reputation as one of the most active and productive exponents of the New Con-temporary Art Movement. Maintaining its founding commitment to the promotion and support of its artists, Thinkspace has steadily expanded its roster and diversified its projects, creating col-laborative and institutional opportunities all over the world. Founded in the spirit of forging recognition for young, emerging, and lesser-known talents, the gallery is now home to artists from all over the world, ranging from the emerging, mid-career, and established. The New Contemporary Art Movement, not unlike its earlier 20th Century counterparts like Sur-realism, Dada, or Fauvism, ultimately materialized in search of new forms, content, and expres-sions that cited rather than disavowed the individual and the social. The earliest incarnations of the Movement, refusing the paradigmatic disinterest of “Art” as an inaccessible garrison of ‘high culture’, championed figuration, surrealism, representation, pop culture, and the subcultural. By incorporating the ‘lowbrow,’ accessible, and even profane, an exciting and irreverent art move-ment grew in defiance of the mandated renunciations of “high” art. Emerging on the West Coast in the 90’s partly as a response to the rabid ‘conceptual-turn’ then championed on the East Coasts, the Movement steadily created its own platforms, publications, and spaces for the dissemination of its imagery and ideas. 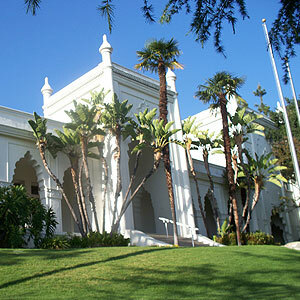 Brand Library & Art Center has been a cornerstone for the arts in Southern California since 1956. This unique public library focuses on visual arts and music and provides free services and programs for a diverse community, including a collection of over 110,000 items, subject specialist librarians, exhibitions, concerts, lectures, dance performances, films, and hands-on craft programs for children and adults. Always evolving, Brand Library utilizes new technologies and continues to develop innovative programs to serve an ever-widening public interested in the arts. Brand Library & Art Center is a branch of the City of Glendale Library, Arts & Culture Department.